Magnificent views over the sea and the nearby mountains. 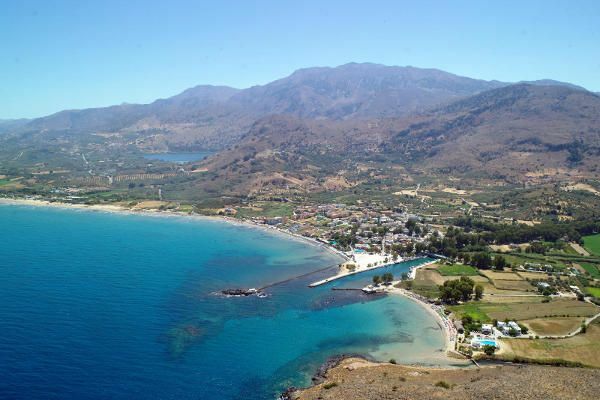 The Corissia Princess Hotel is adjacent to the sea and the fine sandy beach of traditional fishing village of Georgioupolis. 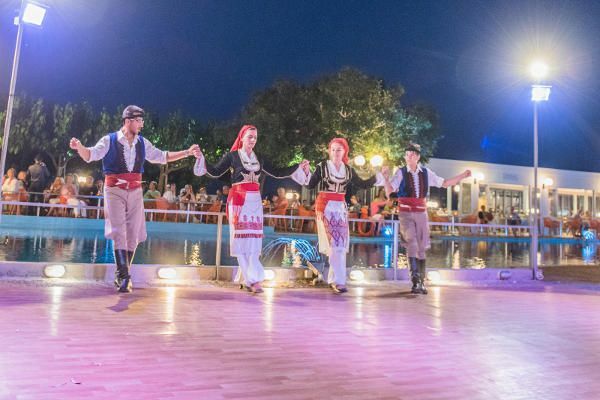 Set in the idyllic Bay of Geogioupolis, only a few steps from your room. Our family-run hotel has 63 rooms and 6 exclusive junior suites spread over 4 floors. In Corissia Princess you will find a roof terrace with a cocktail bar and a unique 360 panoramic view over the bay of Georgioupolis, a garden area with swimming pool and a lobby with a reception and lounge. Just a short walk along the beach promenade you will find Corissia Park, our own beautifully tended park next to the fine sandy beach. It is here you will find many of the facilities we provide for your enjoyment and leisure, these include our large swimming pool with integrated childrens pool plus a childrens play area. 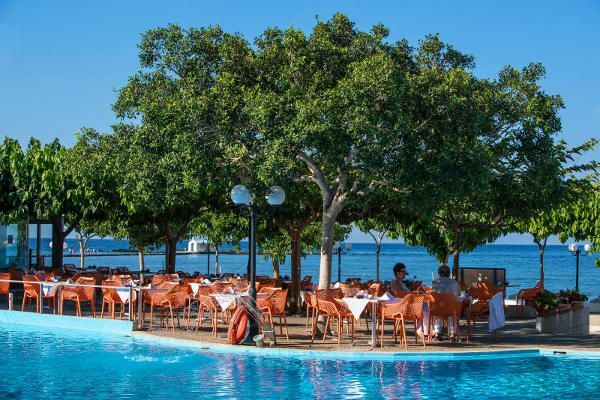 You can relax in the shade of an umbrella or eucalyptus tree, relax over drinks and snacks from our Pool Bar or enjoy breakfast and dinner in our sea view restaurant. Our disabled guests can be assured we also provide accessible facilities. Free WiFi and Internet access is available throughout our hotels and Corissia Park. 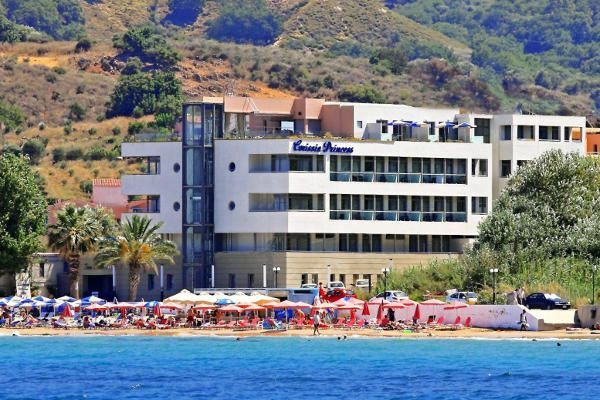 The Corissia Princess Hotel is situated within the tranquil, picturesque village of Georgioupolis directly beside the sea, just 3 minutes walk away from the village square. 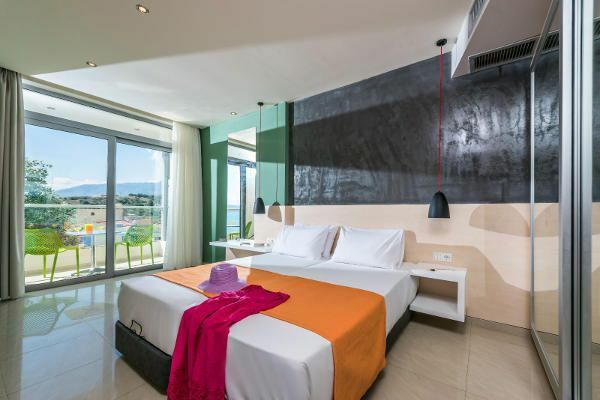 All rooms at Corissia Princess Hotel have beautiful sea views. Our double rooms contain a double bed (with separate mattresses) and are best suited for 2 guests. They can also be booked for single use for one adult. In addition, a travel cot can be placed in for families with a small child. 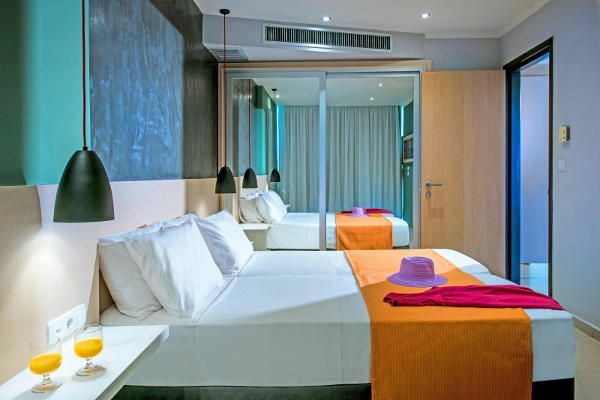 The triple rooms are more spacious and include a double bed (with separate mattresses) and a single bed. For families with two children, there are also four bedded rooms available. These include a double bed (with separate mattresses) and two single beds in two separated rooms with a connecting door. Our quadruple rooms have a very large balcony with beautiful views of the sea. 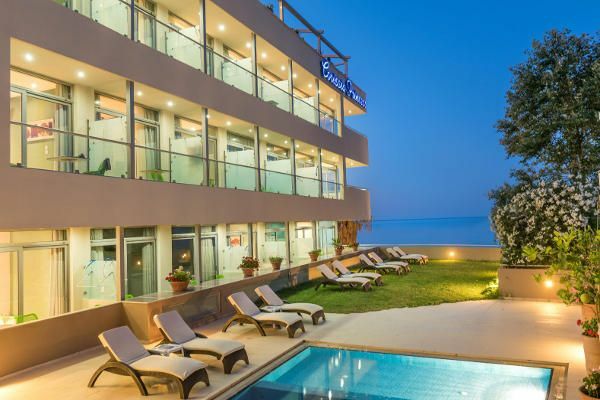 An added luxury comes with the all round balcony stretching over the entire width of your suite, giving you the best of the stunning sea views over the Bay of Georgioupolis. 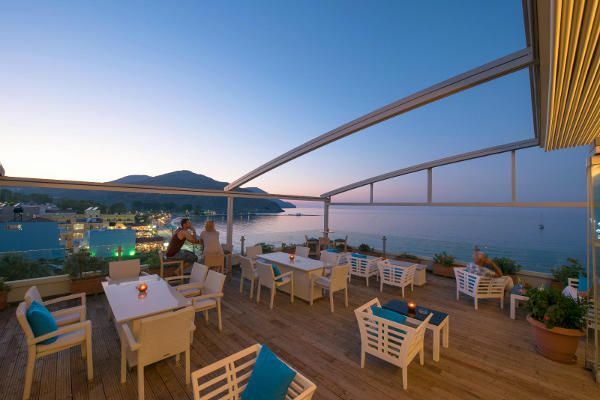 Our aim is to offer you all around satisfaction when dining in our wonderful sea view restaurant. Your enjoyment, and service, is of great importance to all members of our well trained staff. We offer both breakfast and half board. Every morning and evening you can make your choices from our generous hot and cold buffet. Relax, in comfort, over you meal enjoying the glorious views over the sea. 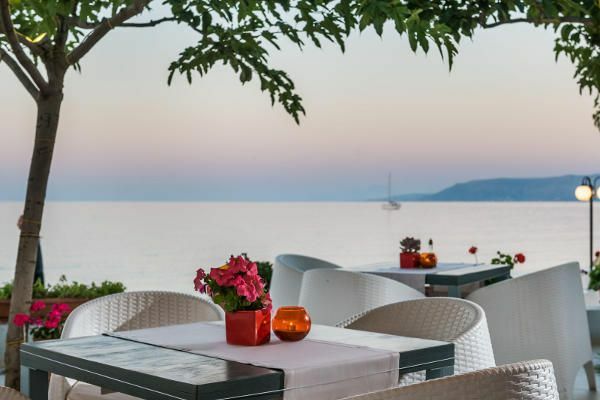 The Corissia Hotels restaurant can be found in the delightful Corissa Park, right by the sea and only a few minutes stroll from your room. 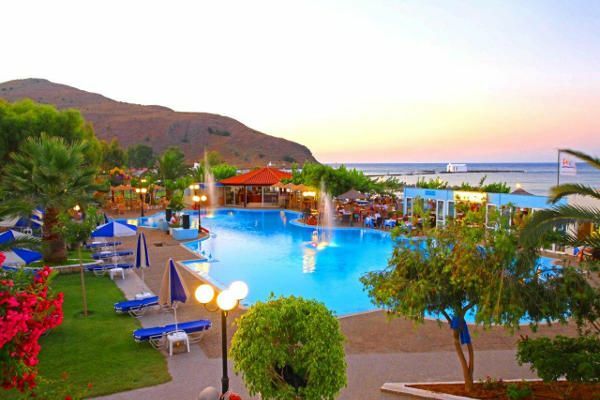 The Corissia Princess Hotel is located on the sea, separated only by the promenade from the sandy beach. Up to the village centre is only 1-2 minutes walk. 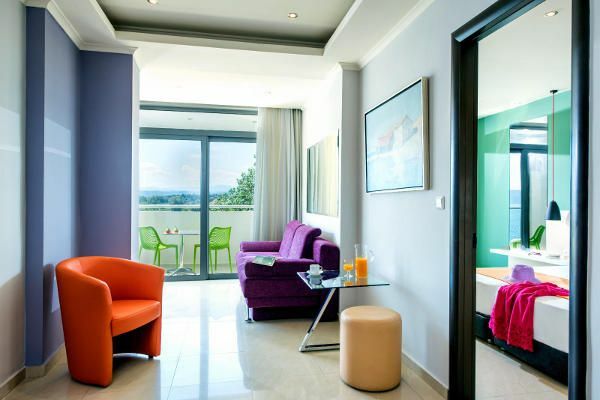 With many different types of rooms Corissia Princess is very suitable both for couples and families with children. 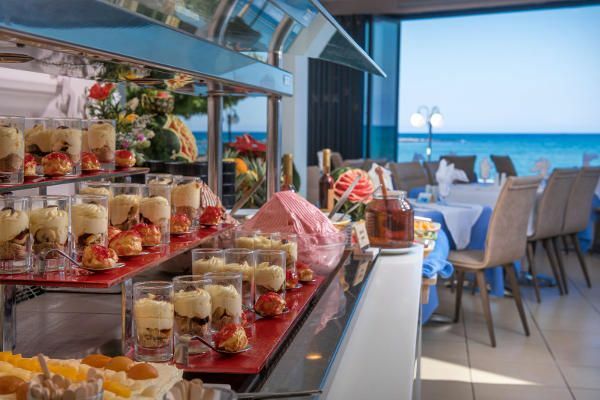 We offer generous and tasty breakfast and dinner buffets in our sea view restaurant in the Corissia Park located by the sea. In several areas of our facilities you can use our Wi-Fi and get free internet access. You can obtain beach towels at our reception. The rental fee is 1 € per towel and day. The bathing towels can be changed daily.